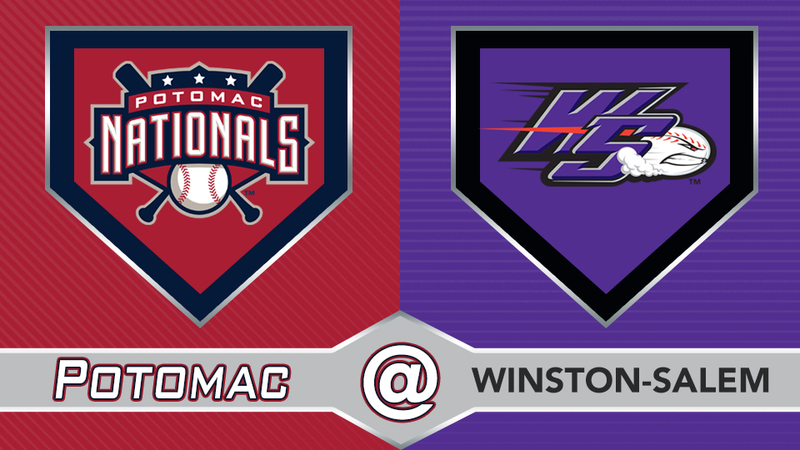 Winston-Salem, NC-The Potomac Nationals (3-5) fell in their first road game of the season on Thursday, dropping their series opener against the Winston-Salem Dash (4-4) by a score of 8-6 after a go-ahead two-run home run from Dash center fielder Luis Robert . The home run capped off a 3-for-5 night for Robert, who now leads the Carolina League with five home runs and 14 runs batted in on the young season. It snapped a four-game losing streak for Winston-Salem, and in turn extended Potomac's early skid to four games. The P-Nats entered play Thursday coming off back-to-back shutouts at the hands of the Carolina Mudcats, but quickly erased any memory of their offensive struggles with a three-run first off Dash starter John Parke . Telmito Agustin 's RBI single put Potomac on the board, Aldrem Corredor followed with an RBI groundout, and Nick Banks capped off the rally with an RBI double. Agustin's hit was the first of many for the Nationals left fielder, who turned in a 4-for-5 night. It marked the first four-hit game of the season for any Potomac batter. The lead would not last long, however, as P-Nats starter Grant Borne lasted just four batters before leaving due to injury. The lefty retired one batter, and ultimately let in three runs on Tyler Frost 's RBI double and Craig Dedelow 's RBI triple. Andrew Lee was pressed into duty early, getting the final two outs of the first inning and ultimately going 4.2 frames of solid relief. Lee allowed a run in the second on an RBI single from Nick Madrigal , and another run came home in the third after Zach Remillard 's leadoff double, but the righty kept the game in check through the middle innings. The P-Nats try to even up the series on Friday as they send RHP Jackson Tetreault to the mound against Winston-Salem's RHP Blake Battenfield . First pitch at BB&T Ballpark is set for 7:00pm. The Potomac broadcast will get underway at 6:45pm with the P-Nats Leadoff Show. You can listen to the Potomac broadcast at potomacnationals.com, at http://bit.ly/P-NatsBroadcast, or on the TuneIn Radio App.